All my life, I had hair that was on the verge of being oily. I had to wash my hair everyday, or it would look greasy and flat. Then I hit 40. Actually, I moved up north from the Gulf Coast and hit 40 simultaneously. Literally, our first Sunday at our church here in the Midwest was my 40th birthday. That’s when my hair began to dry out. And it kept getting worse. It has been so frustrating. For the last six years, I’ve tried everything I could think of. I’ve tried natural conditioners, unnatural conditioners, leave-in conditioners, salon conditioning treatments…you name it. In my early twenties, I was a hairdresser, so I know what to do with hair; but, I was stumped! No matter what I did, my hair was frizzy and dry on the ends. Finally, just when I was getting ready to shave my head in frustration, I found something that worked for my hair. So, in case you’re interested, I’m going to share my discovery with you! My hair feels soft and smooth; and I can finally run my hands through it! I chose essential oils that are good for both hair and skin and help to encourage hair growth. And they smell scrumptious! First, I stopped using gel and hairspray on anything except my bangs. It just dried my hair out worse and made it feel stiff and crunchy. Remember, the longer your hair is, the older it is; so, be gentle with the ends. They are the oldest part of your hair and they are the furthest from your scalp, so they are going to have less access to the natural oils (sebum) that your scalp produces, which means your ends need more added moisture than the hair near your scalp. This conditioner moisturizes the oldest, driest parts of my hair, while leaving my oil-rich “new” hair (the part closest to my scalp) alone. And it is inexpensive and all-natural! Use a natural, moisturizing shampoo (Young Living’s Copaiba Vanilla Shampoo is a good choice) and gently towel dry your hair. I usually throw my head upside down and scrunch dry my hair with a blow dryer, concentrating on drying the roots first on a low setting. Style as usual, but avoid getting any gel or hairspray in the longer portions of your hair. Once your hair is dry, place a tiny bit of the following conditioner in your hands and rub together. Then scrunch the ends of your hair, concentrating on the dry ends or any portions that have frizz. Do not run it through your hair or get it near your roots, as you may wind up with a greasy look. 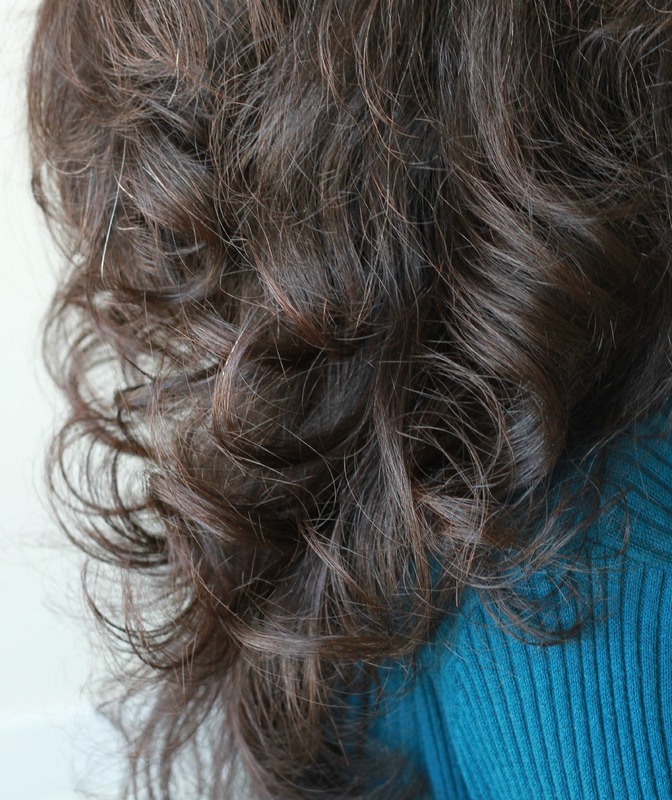 However, if your hair is naturally curly or very course, you may want to try using it a little more liberally. Store in a jar in the bathroom and enjoy! Let me know how it worked for you! Whip coconut oil in a food processor until fluffy. Add jojoba and vitamin E oil in a stream. Pour into a jar and stir in essential oils (this way your food processor won’t absorb the scent of your oils).